2 – In a pan, heat 1 tbsp olive oil then add the onions and garlic. 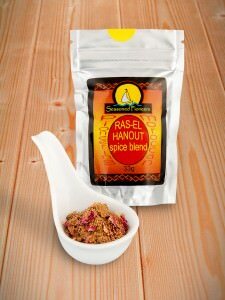 Soften, then add 3 tsp of Ras-el-Hanout, fruit, nuts, juice of one lemon and honey and cook for 2 minutes. Remove from the heat, cool slightly then pulse in a blender until you have a sticky mass. Stuff the neck end of the chicken. 3 – Combine the remaining 4 tbsp olive oil, 2 tsp Ras-el-Hanout, juice of a lemon and seasoning in a bowl, then massage into the chicken on a baking tray so that it is completely covered. Stuff a halved lemon into the cavity then place the chicken onto the middle shelf for 20 minutes. 4 – Turn down the heat to 180C/Gas Mark 4. Roll the fennel in the juices in the tray and bake the chicken for a further 20 minutes per half kilo. 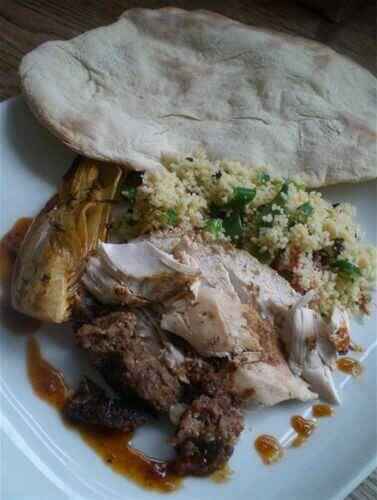 5 – Remove from the oven and allow to rest for 15 minutes. Make a quick sauce by deglazing the pan with a little water then stirring in some honey. Carve the meat with a slice of the stuffing and serve with cous cous, flatbreads and a good drizzle of the sweet, spicy and sticky sauce.